With the newest development "GRIP", MPL opens the world of high performance graphics to the PIP Family. The new expansion product called GRIP acts as an interposer for MXM graphics cards with state-of-the-art GPUs from NVIDIA or AMD, as well as others. 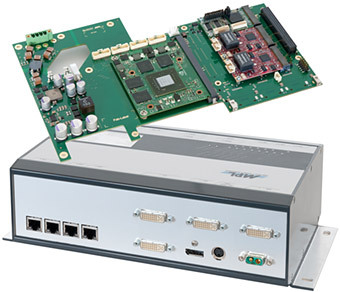 The GRIP uses the PCI/104- Express (x16) interface to support the maximum interface speed available from the host board. Additional to the graphic expansion are up to 4 mPCIe sockets and up to 4 Mini-SIM modules. The GRIP allows to configure your system according your needs. The GRIP has been designed to withstand harsh environments and extreme temperature conditions without the need of a fan. The special rugged design, combined with the best industrial-grade components, offer high reliability and long-term performance. All MPL products are 100% designed and manufactured by MPL AG in Switzerland. This guarantees high quality, long-term availability and repair, and gives you security you can trust.